The photos above were taken during my trip to Rishikesh, right in front of the Huge Shivji statue. I have been to loads of religious places (trust my mom to make sure of that) but nothing comes close to the Ganga-Aarti I witnessed at Rishikesh. It was very different from a normal puja as all the rituals were carried out by the kids pictured above. No adult pundit was allowed to be involved in the ceremony. There were kids right from the age of 4 or 5, I guess. After the end of the ceremony though, I found out that these kids were those that had been orphaned after the Gujrat earthquake and had no place to go to. The kids are now residents of the temple at Rishikesh and the temple committee looks after them. 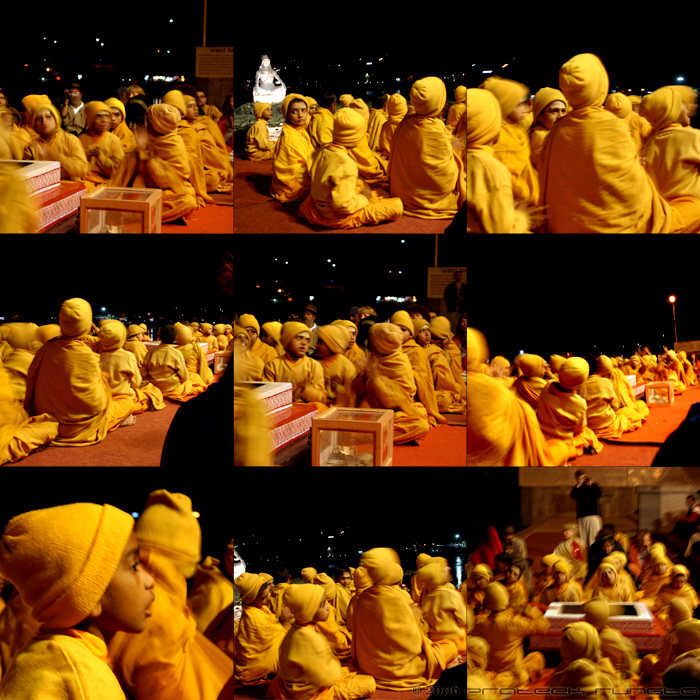 It was really touching to see them all decked in saffron, so happy and vibrant, some sleeping, some dreaming, some singing, and some laughing. Hope they too have a great 2006! Happy New Year to u too! :) This is really nice, never knew children so young were included and also conduct pujas.. and esp since the temple helps the orphans this way is really nice to see... its truly a rare thing. And your portrayal of these children is really cool. Hope the best for them too. It has come out very nice. i had seen individually ,but this collage is great!!!!!!! keep it up!!! Really vibrant pictures and vibrant kids. Hope they have a great year and a great life ahead. Happy New Year. Thanks a lot for all your lovely comments and wish you all a Happy New Year once again!